I'm an aging Generation X'r coming to grips with mortality. In the old days, nobody could "out party" me. Now, it's "lights out" by 9 pm. I enjoy movies, music, and reading books. 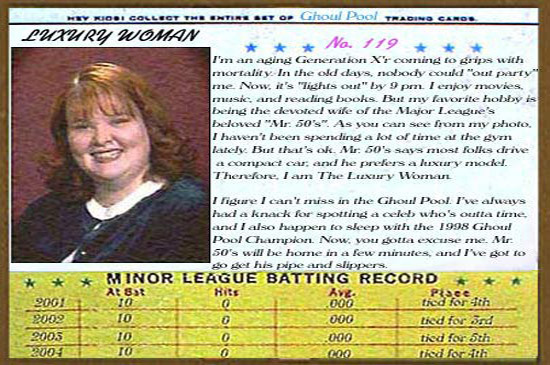 But my favorite hobby is being the devoted wife of the Major League's beloved "Mr. 50's". As you can see from my photo, I haven't been spending a lot of time at the gym lately. But that's ok. Mr. 50's says most folks drive a compact car, and he prefers a luxury model. Therefore, I am The Luxury Woman. I figure I can't miss in the Ghoul Pool. I've always had a knack for spotting a celeb who's outta time, and I also happen to sleep with the 1998 Ghoul Pool Champion. Now, you gotta excuse me. Mr. 50's will be home in a few minutes, and I've got to go get his pipe and slippers.